Site Manager is an advanced online website management application for church ministries, schools, and Christian businesses that are looking for an easy to use but feature rich CMS. For one low monthly price you get all of the features and designs of Site Manager plus premium tech support for your website. Have you ever taken a look at the code underlying a web page? You see lots of <s and p's and h2's and stylesheets and other symbols that you don't quite recognize. If you're like most people, you are thinking "There is absolutely no way for me to figure this stuff out!" Thus, you are relegated to paying a design company thousands of dollars to build and maintain a web site for you. Well, we decided to put an end to that with SiteManager. The cost for SiteManager is only $29.95 per month, and a $50.00 setup fee. SiteManager allows you to manage all your pages - an unlimited number of pages. Manage the pages in your site more efficiently. Add multiple calendars, photo albums, and more. 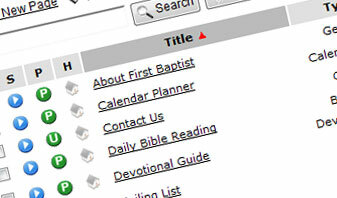 Add Bible reading and searching tools in English, Spanish, German, French, or Dutch. Add a media library to your site. Restrict access to certain pages and features to registered members of your site. Setup multiple site editors allowing you to delegate site management to other users. The designers of FaithfortheFamily.com have teamed up to deliver new site designs and themes which are available to all our SiteManager accounts. Choose any of them then try another! Change site styles whenever you wish. Modify the text and picture(s) in your site's header. 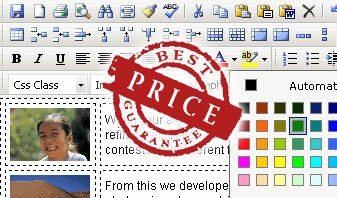 Utilize new site styles as soon as they are made available for no extra charge! Modify the content in sidebars more easily with plugins and settings. Manage all of your site's photos and albums in the one-stop SiteManager. Add multiple photo albums to your site. Generate higher quality thumbnails for your photos. Display photos in a more intuitive photo gallery. Whether it's sermons, music, or videos, SiteManager allows you to manage it all online. Upload audio and video easier and faster. Add key information about your media. Display media on your site in an on-site media player. Automatically convert files to a universal format. 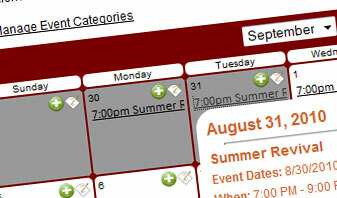 Create and maintain your ministry's event calendar with SiteManager. Keep your members informed of upcoming events. Add events over a date range. Add more information about the members in your ministry. Manage e-mail addresses more efficiently. Enhance your web site's search engine placement. Get helpful tutorials to common questions. Track the number of visits to your site with advanced site statistics.